"Spatial Considerations" features paintings in several media by Jeannie Donovan and photographs by Pamela Cobb. This show is the examination of the unique perspectives and environments in each of their lives. Each piece explores a personal response to the landscape, architecture, or natural forms. The every day things we look at and see as ordinary or mundane become extraordinary in the work of these artists who are both concerned with preserving the natural environment. Jeannie Donovan is a painter, papermaker, and graphic designer who has a BA in Art from Emmanuel College and an MFA from U Mass Dartmouth. She grew up on a small farm in western Massachusetts where she formed deep connections with and reverence for nature. She paints primarily in watercolor, acrylic, and ‘pulp painting’, a technique she learned as an apprentice at Rugg Road Handmade Paper Studio formerly in Allston, Mass. The process involves using beaten paper ﬁbers that are pigmented prior to creating the piece, layering the sheets onto a thick base sheet. The imagery is then drawn on the wet surface using ﬁnely beaten liquid pulps applied with plastic bottles or spoons, no actual ‘paint’ is ever applied. Donovan describes her work as ‘semi-abstract realism’ because though the imagery is realistic, some areas evolve as pure color and shape. These areas are derived from her memory of the experience: a house in Mexico, the Big Dig road constructions, her high school classroom, a stone wall at the edge of a farm. Ordinary scenes re-examined as extraordinary. She has exhibited in numerous solo and group shows in the Boston area, New York, Nantucket, Beverly, and Cape Cod. Her paintings are in private and corporate collections and she is a member of the Rocky Neck Art Colony and a life-long member of the Artists Association of Nantucket. Pamela Cobb is a photographer who grew up in New York City and lived in northern California for eighteen years before moving to western Massachusetts in 2006. She has a BA in Art History from Kenyon College and an MFA from California College of the Arts. Her photographs examine the perception and experience of the landscape and the illusions of place. She seeks to portray the mood or spirit evoked by light, shadow, and scale. Her work has been exhibited nationally and is in the collection of the San Francisco MoMa Artists’ Gallery. It has been purchased for the Hyatt Pritzker Collection and for numerous private collections including that of architect Frank Gehry and sculptor Jamie Carpenter. Cobb has been awarded residencies by the Ucross Foundation in Wyoming and the Blue Mountain Center in New York. Contact Val Toukatly (studios.portermill@gmail.com) for more information. "The Gallery at Porter Mills proudly presents Memoraphilia, a senior thesis exhibition consisting of Montserrat College of Art B.F.A. candidates: Emily Fung, Ania Gruca, and Elizabeth Paddock. This exhibition consists of three large scale installations which act as interpretations of the various memories and relationships which objects hold in the human consciousness. 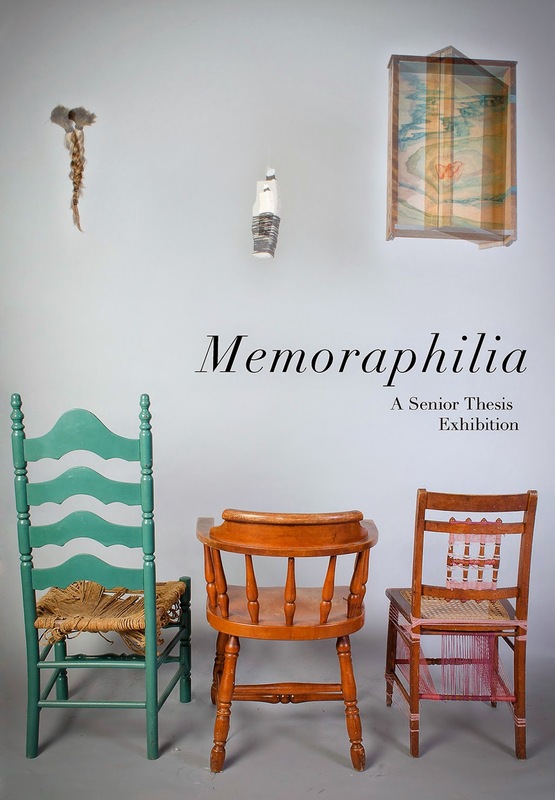 Memoraphilia will be on display from Wednesday, April 16 – Monday, April 21 2014 with a reception taking place on Thursday, April 17 from 5:00–8:00pm. The exhibition’s title Memoraphilia can be literally translated to mean “an abnormal liking, or tendency towards memory,” a theme that runs constant across the works presented. It is of no surprise that these three artists use objects as their chosen medium in creating the installations, as each and every human being associates objects with their own personal memories and narratives which are influenced by the “things” which surround them. The installations presented are not meant to be solely viewed, but to be experienced. Viewers are encouraged to draw their own connections, and to create their own narratives based on the scenes built before them. In Gruca’s work, the domestic setting of home is a recurring theme. Objects are placed in and surrounding a shack-like home constructed in the gallery space. Gruca incorporates found objects which feel at home within the quaint domestic setting, yet upon further inspection not everything is as it seems. In a surreal twist of perception, once recognizable objects and domestic furniture become altered versions of themselves. An axe outside of the home splits braids of hair; a lovingly baked cake is mutilated by nails; a bed becomes a coffin. Playing on a juxtaposition of what is traditionally considered “feminine” or “masculine,” Gruca references the histories ingrained into objects, but alters them thus creating new memories. In a sense she uses objects and the domestic setting to create an exaggerated narrative which plays off the viewers perceptions of the scene laid out before them. Paddock’s installation presents viewers with an historical shrine suggestive of a bedroom. This intimate space focuses on the way rituals and memories transform the spaces around us, specifically with the sacred bedroom. Her installation analyzes the relationships and bonds we hold with the objects in our lives and how they become relics of our identities. Every object is painstakingly placed, evoking the ritualistic organization of bedroom spaces and memory. From scrawled notes and photographs hidden within drawers, to a weeks worth of outfits assembled in advance, Paddock encourages viewers to explore her installation in order to both experience the assemblage of her own identity while simultaneously drawing connections to that of their own. In Fung’s installation, viewers are guided through an enclosed narrow corridor full of wrapped and concealed objects. The forms presented were created by building a mold of objects given to her, destroying them, and bandaging the shattered pieces in order to bring to fruition a new dialogue with what the objects once were. In a sense Fung is much like an alchemist; from the objects she copies, destroys, and recreates she is able to transmute new meanings onto the obscured remnants of the objects created while still retaining the integrity of what they once were. Although, viewers cannot necessarily see it - the objects she binds and wraps have come full circle. They are simultaneously no longer what they once were, but something completely new, made from the ashes of their former selves. Ambiguity and arrangement are Fung’s formal tools in order to present these keepsakes to viewers and to encourage them to challenge the meaning of the objects before them." Affordable art and gifts from local designers, jewelers, and more! 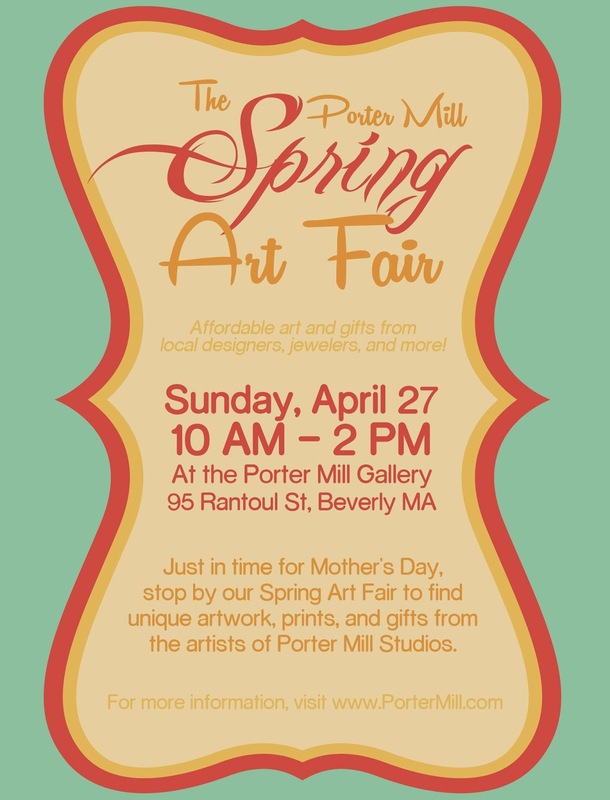 Just in time for Mother's Day, stop by our Gallery for the Spring Arts Fair where you'll find unique artwork, prints, and gifts from the artists of Porter Mill Studios.